Today’s battle between musician and king is one of the more intriguing pairings of Lent Madness 2014. While on seemingly disparate paths, both J.S. Bach and Alfred the Great were fighters. Well, Bach once tangled with a bassoonist and Alfred fought Vikings but you get the point. However this match-up turns out, we know Bach will remain victorious in one category: children sired. He famously fathered 20 children while Alfred had a mere quarter of this number. In yesterday’s neck-and-neck race between James Holly and Harriet Beecher Stowe, Harriet eked out a victory 51% to 49%. She’ll go on to face Alcuin of York in the Round of the Saintly Sixteen. In the same way it’s never too late in Lent to begin a Lenten discipline, it’s never too late to join in Lent Madness! If you’re just checking out this fun, informative way to learn about some amazing people and grow your faith, click here to watch our brief Voting 101 video. We also have some general information for those new to Lent Madness here. If you haven’t liked us on Facebook or followed us on Twitter, you’re missing some supplemental conversation. Granted there’s plenty of that among the hundreds of comments that follow each match-up but some people just can’t get enough of the Madness! Well, it’s been a wonderful, wacky, heart-pounding first full week of Lent Madness 2014. Yesterday marked our second 1% margin of victory this week (see Antony of Egypt vs. Mary of Egypt). Yowza! The Supreme Executive Committee authorizes you to take a deep cleansing breath this weekend and then get ready for our next match-up on Monday morning as Lydia tangles with Moses the Black. For someone who was orphaned at age nine and never traveled farther than 225 miles from his birthplace, Johann Sebastian Bach left a legacy to the world of music much grander than his circumstances might suggest. Born in 1685, the eighth child of a musical family in Eisenach, Germany, Bach studied organ and voice. He was known for his stellar soprano voice. After the loss of his parents who died just months apart, he lived with his older brother, Johann Christoph, an organist who likely continued Bach’s training and introduced him to contemporary music. Bach’s first real job as an organist came at the age of eighteen when he was hired in Arnstadt, a city in central Germany. Over the next several years, as he moved to progressively larger and more prestigious positions, he began composing in earnest. At age 22 he married his first wife, Maria Barbara, and rather famously, engaged in a street fight with a bassoonist. After stints in Weimar and Köthen as Kapellmeister (musicmaker), Bach landed in Leipzig in 1723 as Thomaskantor, or director of music, a post he held for twenty-seven years until his death. During this period, he composed more than 300 sacred cantatas that correspond to the weekly lectionary readings. In addition, he continued composing the large-scale orchestral works for which he is well known: the St. Matthew Passion and St. John Passion for Good Friday, the Mass in B Minor, the Brandenburg Concerti, and hundreds of other works. A catalog of his work created in 1950 lists some 1,127 surviving pieces; many more compositions were lost over the years. In Bach’s day, the church was the only place an accomplished musician could make a living for himself and his family. And Bach required a substantial living: between his two wives (the second was the much-younger, highly gifted soprano Anna Magdalena) he fathered twenty children, ten of whom survived to adulthood. However, his deep devotion to the Christian faith was evident: he not only composed the sacred works but also taught Luther’s Small Catechism classes while at Leipzig. No one of his stature would have been forced to teach Sunday School. J.S. 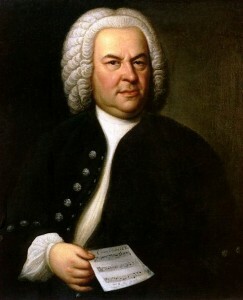 Bach died at age 65 in Leipzig. He kept composing until the very end, despite contending with blindness for many years. His deep dedication to his craft resulted in some of the most beautifully complex music humankind has ever created. Certain of Bach’s pieces are the musical equivalent of a gothic cathedral. They make our hearts soar toward God. Almighty God, beautiful in majesty and majestic in holiness, who teaches us in Holy Scripture to sing your praises and who gave your musicians Johann Sebastian Bach, George Frederick Handel and Henry Purcell grace to show forth your glory in their music: Be with all those who write or make music for your people, that we on earth may glimpse your beauty and know the inexhaustible riches of your new creation in Jesus Christ our Savior; who lives and reigns with you and the Holy Spirit, one God, for ever and ever. Amen. Alfred the Great united the kingdom of England and was its first great moral leader. Born around 849, he was sent to Rome at the age of four, where some sources say he was confirmed and anointed king by Pope Leo IV. This was a trifle premature, since Alfred had three older brothers, one of whom deposed his father shortly after they returned home to England. Until Alfred came of age, the kingdom was divided between his brothers, Aethelbald, Aethelred, and Aethelbert. During this period, Alfred fought alongside his brother, Aethelred; first, against the “Great Heathen Army,” led by Ivar the Boneless, then against the invading Danish—also known as the Viking—army. This second battle did not go well, at least for Aethelred. He died, and Alfred became the new king in 871. This was less impressive than it sounds. The Vikings had conquered most of England, but by 880, Alfred had managed to push them back out, and for the first time in history, unite England under a single ruler. Alfred then set about reforming legal practices throughout the land. He issued a new legal code to standardize the laws throughout all England. This was called the Doom Book, which took inspiration from the Ten Commandments and the gospel’s call for mercy and combined them into a comprehensive system that meted out fines and payments instead of violence. Alfred also saw it as his job to increase education and religious piety. So he began a court school to improve his own children’s learning as well as issued a decree that all primary education occur in English. To aid this cause, he commissioned the translation of numerous books into English, including the Venerable Bede’s Ecclesiastical History and the Dialogues of Gregory the Great. Alfred also translated several books into English himself, including the first fifty Psalms and Boethius’ Consolation of Philosophy. 246 Comments to "J.S. Bach vs. Alfred the Great"
For me, music wins the day — EVERY day!!! Me too. Bach it is! Bach gets my love and my vote, but as a musicologist, I’m compelled to point out that it isn’t quite accurate to say that “no one of his stature would have been forced to teach Sunday School.” Bach’s job in Leipzig was at the St. Thomas School for choirboys and other pupils (how many of each group isn’t precisely known, but he complained to the town council that they were giving too many places away to pupils with connections but no musical ability), where in addition to music he taught Latin and, yes, theology and served as dormitory supervisor. He was responsible for the music at Leipzig’s four churches, having to divide his (too few) boy choristers, from which he needed to make both choir and orchestra, among them for the concurrent services, three of the four being entrusted to older boys, with Bach and the second-tier group alternating between the two main churches. All of this is not to undermine the sincerity of his religious feeling, which was strong and deeply personal. He in fact had to pass a religious test to qualify for the job. However, it would be wrong to look at his teaching through our modern lens of Sunday School volunteers, as it was in fact a responsibility of his deeply frustrating and often thankless job. I guessed that the editorial Sunday School comment wasn’t going to get past at least a few of the Lent Madness voters! Was the comment a reference to a certain priest who hasn’t taught Sunday school? Seems I read something like that recently. Thanks, Philip, for your knowledge about Bach’s work in Leipzig. I bet the original sources you have studied shed some light on the frustration and lack of appreciation that church musicians had in Bach’s time. You know, some things never change! So come Sunday, thank your musician. Music wins for me. A gift that I can only receive vs give. Ah! After the first week of this Madness, I am seeing quite clearly how valuable all of our gifts are. Hide them under a bushel?? OH NO! This little light of mine, I am gonna let it shine:)!! I agree! Neither seems worthy. I don’t understand what you want from a saint. Neither is worthy??? I’m a lifelong Christian, but on reading the bios, I don’t consider myself “worthy” alongside just about any entry in this year’s match-up — and hence not entitled to declare any of those listed as “unworthy”. Sebastian was a remarkable musician and composer, and is especially noteworthy for single-handedly changing forever the face of Western Christian music. His profound faith shines through his cantatas and motets, and his music is such that people actually see Christian themes in many of his toccata and fugue compositions. Anyone with a reasonable awareness of the underpinnings of Christian music in the Western world has to be cognizant of the enormous debt owed to this profoundly faithful musician. I can only suppose that the good writer was confusing saints with martyrs. Not that it matters. Sebastian signed his manuscripts SDG, an abbreviation that loosely translates, “To God Alone be the Glory.” So what anyone else thinks is unimportant to him, I am sure. Yes, except that, after Antony, this one was less jolting. I voted for Alfred because of his ordering of things in a better fashion for England, both governmental and religious. That, and his brother’s names were weird, so I figure that the SEC enjoyed that one! You should have to listen to Bach’s music for a month! Soli deo gloria! Yes, yes, yes! With my favorite organist playing it. Unites my soul with God!! How about Misere mei Deus? I’d vote for Gregorio Allegri over both Handel and Bach if we are going to pick just one example for each. A priest, a singer, a composer. A reference in Wikipedia: “In addition to his virtue, he had singularly good nature. He gave generous alms to the poor, who were always on his doorstep, as well as to prisoners, whom he visited daily, as I was assured by one of his pupils, a man worthy of belief, who is still alive.” Sounds like a worthy competitor for next year. I love Allegri’s Miserere mei Deus! Interesting fact: for a very long time, it was actually forbidden to write down the music to that piece because the Vatican wanted to keep it just for services at the Sistine Chapel – it was felt to be so important/beautiful/what have you – and they threatened to excommunicate anyone who wrote it down. Have you ever listened to Bach’s music?! An easy decision for me today. Bach all the way! Alfred is great for sure, and greatly to be admired. But Bach’s music spans centuries and unites hearts and minds across eras, cultures,reaching into human souls in a timeless, grace-filled beauty. Such a God given gift he shared for the ages! Bach is the greatest (I never leave my choir pew until the last note is sounded on a postlude penned by him) and Alfred is “the Great.” But who has had a greater “impact” on our church, Christianity, or humanity in general? Ach! (ahem) Bach, I think. It’s not necessarily the lyrics or religious name of Bach’s music that make it spiritual. The music itself is transportive. The exquisite beauty of Bach’s music always reminds me that this was/is truly a wonderful gift from God to Bach and to us. Thank you for your thoughts. I voted for Alfred because as a music lover (after reading the bios) it felt to me that Bach’s work was no hardship and uniting a people around peaceful means of redress feels like the type of “God’s work” that is far less pleasant and joy filled, which in some way made it more “saintly” to me. You reminded me of the “saintliness” of God’s Gifts as well as God’s work. I cannot imagine our world without Bach’s music which stirs my soul with beauty and awe. Two good candidates with lasting impact on our society. Hard to decide between them. Poor Alfred is going to get slaughtered. But it was really impressive to me that Bach was a “Sunday School Teacher.” In so many ways, these lay people who take on early childhood religious education are the backbone of the faith, so yeah, Bach all the way. All that “doom” is referring to is one’s obligations/responsibilities under the law. It’s also related to “deem” as in “what you deem fitting/suitable.” It’s not “death/doom/destruction/horror” and all that, not in the Anglo-Saxon sense. I also read that every year he held a Christmas Pageant at home with his many children, assigning and acting out the Christmas story with them. Way cool!! Prequel to The Sound of Music? As a church organist, I love Bach and his music. And I believe music touches the hearts of man in many important ways. Having said this, what Alfred did was more important to the advancement of justice and morality for mankind. Therefore, he gets my vote. I’m with you in this one. Although Bach’s legacy is huge, what Alfred did touched and improved the lives of ordinary people which is what God has told us all to do, each as we see it. For the sake of debate, wouldn’t you say that Bach did the same: touched and improved the lives of ordinary people? That’s how I see it! Alfred may have been Great but Bach knew GOD is great. SDG. With his music Bach left us a “great” legacy! Since my grandparents came from Sweden, there’s likely some Viking ancestry back there somewhere. That alone would make me vote for Bach, his glorious music not withstanding. If Alfred had had a different opponent, I would have been likely to vote for him. But as it is…. Harriet broke my perfect bracket. Let’s see if J.S. can bring music to my ears, as he has for my whole life. Sublime artistry to the glory of God. S.D.G. Bach signed his compositions “Soli Deo Gloria” (Glory to God alone). Every note expresses man’s desire and his particular genius to offer up praise to the one who deserves it with the sounds of music. Amen! Elizabeth, I didn’t know that excellent point! thanks for the heads-up. I’m following the Society of St. John the Evangelist’s Lenten programming as well as Lent Madness, and today, the question is “what does God especially cherish about you?” (www.ssje.org). That is a question I had never thought about before; I realize that I had understood God’s love as more universal than personal or specific. But then I thought: music! God cherishes that my own path to faith wandered through the church music I sang in an otherwise entirely secular childhood. He also cherishes my struggle with ego in singing (Am I good? Am I as good as I want to be? Can I let go of my vanity and just sing for the love of it and the exultation of the music and the god it glorifies?!?). Which is a long way of saying I’m leaning toward Bach. But what Lent Madness is teaching me is that I don’t have to decide in a rush. I can linger with this decision. I don’t have to stick with my first inclination–but it’s okay, too, if after time for thought, and prayer, and the plain distractions of life, I do. And I think that’s a valuable lesson — a lesson in peace, in relaxing into faith — for me to take through Lent and into Easter and beyond. I learned to ponder the comments before voting after the first vote. I have gained so much insight from reading everyone’s opinions. Wow. That is indeed a powerful lesson and a gift. I deeply admire and respect your open spirit this season. Blessings! The SSJE LoveLife theme is the perfect counter-balance to Lent Madness, and then throw in the NE Regional Lenten Carbon Fast emails and the Daily Office email and I don’t get any work done until noon. Bach has always been a way of praying for me. No question on this one! Yes, count me among those who pray through music, and especially through Bach. Without Alfred the Great we would be in a sorry state. I vote for him in honor of my Grandfather,a Great Methodist, Alfred Benjamin King. This is a harder match up than it appears from the outside. Bach, oh how he moves my soul to flight, as he does for millions. And yet Alfred, whose contemplation of a spider has been part of my mental equipment since childhood, and who lived what a good leader should be, promoting mercy and education, is a model totally worth celebrating. Courage is more on Alfred’s side, sheer genius on Bach’s. Tough decision. It was Bruce and the Spider but I was disappointed to see no mention of Alfred and the cakes. Remember that one? He burnt the woman’s cakes and she scolded him soundly not knowing who he was. If you have ever done research on a saint, you might have Lent Madness. If you sit by your device waiting for the clock to strike 8 a.m., you might have Lent Madness. If you daily rend your heart, and sometimes your clothing, over which saint to choose, you might have Lent Madness. If people are concerned because they overhear you warmly speaking about “shank and gun,” you probably have Lent Madness. If you hear about SEC and brackets, you think about saints instead of sports, you might have Lent Madness. If you have a personal “Lentorium” collection, you might have Lent Madness. If you admire the improvements in the Clairevoyatron over the years, you might have Lent Madness…. Having learned a few Bach tunes on my guitar, I’ve come to appreciate the sheer genius of the man. Easy vote today. I should have added that the singer is not Peter, but is singing about Peter’s lament. Lovely! Thanks! Am working on “Bleed and Break”from Matthew’s Passion now and was just at a concert with pianist Angela Hewitt playing Bach into the night… I do love Alfred, but think it has to be Bach for me. Ack! It has to be Alfred the Great! It was through his leadership that English literature was started. You can argue that without Alfred the Great commissioning the Venerable Bede, there would be no Chaucer, no Milton, no Shakespeare. If you love the English Language, you need to vote for Alfred. LIKE LIKE LIKE LIKE LIKE LIKE LIKE LIKE LIKE LIKE LIKE LIKE LIKE!!!!!!!!!!! I’m probably going for Alfred, (this is on of the toughest choices here; this and the Wesley brothers) but a bit of nit-picking is called for. Bede wrote and died before Alfred was born. Alfred just had him translated into Old English. KEW, your comments are my Lenten devotion today. As an aging soprano I struggle with these same “performance” issues. I think I will print your words and paste them in my music folder. And SDG is going to be my new motto! Not fair! I want to vote for each of these worthies. Could they not be paired with one of the Egyptians???? Since I have to choose, as a musician I have to go with Bach, but I want Alfred to know that he was a close second for me! Really. Should have paired these with the two that no one wanted to vote for last week! So far I’m one for six. Does that make me a champion of the down-trodden? Sigh. Alfred was an amazing and profoundly spiritual person, and everyone’s going to dismiss him through ignorance. Anglo-Saxon succession was not via primogeniture (an invention of the Normans), you had be to chosen as worthy. Alfred studied in a monastery and was considering becoming a monk… except Vikings kept invading and killing people and he fought against them. When the last of his brothers died, he was selected king not just for his military skill but for his other qualities, including his spirituality. He wanted everyone — women as well as men — to be able to read, and as a bonus write, because he wanted everyone to be able to read the Bible. He commissioned several copies of the Bible and numerous copies of the Gospels, which he considered the most important part of the Bible — most of them in English, not Greek, because he felt people should get the story of Christianity in the language they knew and used every day. He supported religious houses and promoted care for the poor and the ill, as well as constructin a unified system of justice that eventually was the basis for the Magna Carta centuries later. He built the foundations of a culture of thought and spirituality that ultimately led to the people who created Anglicanism. He deserves the epithet “The Great” and I vote for him with joy and enthusiasm. I whole heartedly agree! Very well put. Thank you! Alfred the great for me too. Excellent argument, Katherine! Alfred should have been canonized, not his descendent, Edward, who was so not saintly and confessing. I wish we knew whether Alfred was forcing “English-only” education because English *was* the common language of the people, or because he wanted to switch everyone from their native languages to English. It was one more way to unify the people of England. The native language among Anglo-Saxons was, well, Anglo-Saxon. There were a variety of dialects of it, but Alfred was not forcing the speaker of Brythonic Celt languages to speak or read Anglo-Saxon; they had their own kingdoms. It was the Normans who tried to impose their language on everyone (and exclusively Latin bibles), just as they tried to dump all the (remarkably egalitarian) Anglo-Saxon laws and imposed Norman law. This is why modern English is such a mish-mash. I think it was not English versus other vernacular but teaching in the vernacular rather than in Latin that was at stake. Totally agree here. It’s like if you pick Mick Jagger and Abraham Lincocn people are persuaded by the beauty of music over actions of a leader that transformed a nation and government for all. Alfred seems to be lost in time too many over the sensuality of music. Bach is NOT like Mick Jagger. Bach’s music is evangelical in the original sense of the word (Word!) in that it carries the gospel to the people. Bach is more like Matthew, Mark, Luke or John, set to music…. Oh wait – he did that! It’s so hard to choose, as so many of you have noted. I’m going with Alfred because I can’t imagine the world without him, but I could just as easily go with JS because I can’t imagine my soul with him! Wonderful commentary. Although Bach’s contribution to worship, both in and out of churches, is undeniable and magnificent, Alfred speaks to me as a lover of English lit, as the mother of a teacher, and as someone whose parents met and fell in love in Repton, now a small village in Derbyshire, then a centre of Mercia. I’ve known of Alfred’s connection to Repton since I was a small child, so I had to vote with my heart this morning. Thank you, Katherine, for letting us know more even more about Alfred. He was indeed a great man. The bios of Bach and Alfred tell us why they are famous. They don’t tell us why they are saints. I wonder if they should even be on the Church’s calendar (or in these brackets) at all? Oh pick pick pick. sheeeeeeesh. I agree. Whatever personality traits makes these two “saintly”, we haven’t been told. A human king who rules with love and mercy – how many have there been throughout history? If the bios didn’t explain it adequately for y’all, please read the testimonies of your companions on this mad journey. The Bishop of my diocese calls all of us saints when he address us by letters and when speaking. entirely correct because we are, all of us, saints. definition of sainthood? hmmmm. faithful to their calling, courageous, creative, inspiring to others, did things that moved their situation closer to the Kingdom somehow, we know who they are. Yeah. Or the totality of the baptised members of the Body of Christ. Which is the definition I prefer, for lotsa reasons, not least of them being that it is biblical. You need to listen to Bach’s music! Soli deo gloria! As a longtime soprano in the church choir, I have to go with Bach, it’s just a no-brainer. However, this lenten discipline has also taught me something else: do NOT click the box below that says “Notify me of follow-up comments by email.” Thanks to the SEC for offering that option, but I’ve learned that I really don’t have to time to read each and every 200+ comment in my inbox! Thanks anyway – I’m loving this learning activity! Any human being gifted by God with the talent, skill, knowledge and whatever else one has that enables him to compose the Mass in b Minor wins anything hands down! Sorry, Alfred. I grew up going to rehearsals and concerts of the St. Louis Bach Society which my mother virtually ran for most of my childhood. I met my husband singing in that same choir. I was raised Lutheran so Bach was a minor god — well, actually a relative of mine, a Lutheran pastor, was heard to say “I love Bach more than Jesus!” Once the cantata was over and he returned to his senses, I think he recanted. So now that I have voted, I’m going to go listen to Apollo’s Fire play the Brandenburg Concertos…. I also vote for Alfred. I’ve often thought that he may have been the basis of most of the Arthurian legends. As a musician, I admit my bias. I also know that JS. Bach scripted on every piece of his music “Soli Dei Gloria” (To God alone be the glory.) And I fully believe God has blessed it. As much as I love Bach’s music, continuing to use his music, and other music of his day, in contemporary liturgies betrays his principle: Use current music themes in current liturgies. That is the same as betraying Achbp. Cranmer’s principle: Use current language in current liturgies, by using his words – Rite I.
Karen, you mean Bach was a relative minor in the Lutheran Church. You wouldn’t believe that I married my Lutheran Karen in the U. Mass Chorale. Love it! Yes, he will be Bach…for round 2. Albert Schweitzer referred to JS Bach as “the fifth evangelist” and so he is! My vote goes to him, and judging from the early results I may have picked a winner for the FIRST TIME THIS YEAR!!!! Assuring a pattern of justice and mercy throughout the land. Go Alfred! If this were a competition of musicians, Bach would win, hands down….however, this is a competition of “saints”. First, a little personal background. I am a musician (instrumental and vocal), a school music teacher and choir director…and I just finished up a unit of study with my 8th grade general music classes on the life and music of Bach. I love Bach and recognize his genius as much as anybody. All that being said, I voted for Alfred the Great. Here’s why……composing and music making was Bach’s job; this is how he made the money to support his sizable family. Although he did dedicate his compositions to the glory of God, his main purpose was to put food on the table and a roof over his family’s head; there was nothing particularly spiritual about it. It was his job. Most of his career was spent at St Thomas in Leipzig where he was employed as the church musician. His duties included churning out all of those cantatas, organ music and teaching at the church school. He hated it!!! He had to work with amateur and student musicians and was terribly frustrated., but needed the job to take care of his family. His music was NOT highly regarded during his lifetime and in fact lost his second job (at Cothen) because his music was considered too complicated. It wasn’t until almost a hundred years later when his music was rediscovered (by Mendelssohn ) that musicians recognized the genius of Bach. The bottom line for me: Alfred the Great spread justice and education and stability at a chaotic period in English history. Bach did what he did because this was his job. I do what I do (teach electrical engineering) because it is my CALLING. I get paid for it, and it keeps food on the table. Does that make it any less of a calling from God? Alfred was born into the royal line, he did what he did because of his bloodline. Does that make it any less of a calling? My pastors would, I am sure, do what they do no matter whether they were paid or not, and sincerely hope and pray that holds for all followers of Christ. And ask any musician to stop making music; I will bet you, he or she could not, no matter what the paycheck or lack thereof. Just like to point out there was no particular reason for Alfred to be king — these were Anglo-Saxons, not Normans. There were other people who could have been chosen by the witena gemott (kind of like Parliament) as king. They chose him slightly because he was in *one* of several ‘royal’ families, but predominantly for his qualities,.. and not his ability to fight, which wasn’t well known at the time. It wasn’t just a job to Bach……..anyone that can make human spirits soar through the exuberance of the Brandenburgs to the great Passions and Masses that he wrote…..signing them SDG……..it was his calling by God to hear and record the notes he was given by God. Definitely not just a job. I voted for Alfred, expecting to find myself on the losing side. Indeed, I surprised myself. From the first time I saw the bracket I was cheering for Bach. But Megan’s overview of Alfred’s achievement has swayed me. The Book of Doom – a terribly title indeed! but an amazing contribution to the rule of Law- and the use of the vernacular, rather than Latin, in schooling. The roots of both British parliamentary democracy (including its American expression) and Anglican polity glisten in Alfred’s life. For all those who have voted for contemporary saints whose charism is social reform, I suggest you look twice at Alfred before voting for Bach. Ivar had a condition that made his bones more like cartilage than like hard bone. Please!!! Enough with the House of Virgins already. I voted for Alfred, if only to protest the slander (all right, “misrepresentation” is a better verb there…) of “The Book of Doom.” It’s the Domesday book, better translated as The Book of Judgement – which it was! Come on, Megan Castellan – let’s call it by it’s more correct name and not drive away people based on a Doom-filled title. Besting Ivar is tipping my vote to today’s underdog, Alfred the Great (but not today). You make excellent points. With sincere respect and admiration for Alfred, I still choose the musician over the king. Both men worked faithfully at the tasks set before them. If Bach hated his job, to me it’s all the more impressive that he chose to invest his all in it, to hold onto to his own musical standards rather than “dumb down” his music to suit others, or to simply go through the motions and draw his pay with mediocre work. He offered it all up to God, and the result is music that rings down through the ages and around the world. This is a reply to Lori. The preceding comment, I mean. I hear your position and respect it. Bach did continue composing in the only way he knew how and remained true to his personal standards. At the end of his life he considered himself a failure and his sons’ music (several of his sons were themselves composers) was regarded much more highly then that of Johann Sebastian. It took many years and a whole new generation of musicians to recognize his genius. However, for me, it’s motivation that counts. Bach’s motivation was personal; centered on himself and his family– he did what he did, in the only way he knew how, to support his family–highly commendable, but not “saintly”. Bach was living out his vocation (calling) faithfully. His worldview reflected both the Theology of the Cross and the Lutheran “doctrine of vocation.” Sometimes we are called to take up calls we hate or resist (think Jonah or Moses for just two biblical examples), and the world is basically unfair (as it was to Bach at times). Yet if you have the gifts and a discerned call – even as it might help you earn “our daily bread” – you must share all you are for the glory of God. Your job is always sacred when done out of love for God and neighbor. There can be no higher calling for you. Luther said that even a father changing diapers for a baby was sacred when done in love. I encourage you to think more about this. Consider reading “Luther on Vocation,” or “Listen! God Is Calling! : Luther Speaks of Vocation, Faith, and Work” or even just this short article : http://www.modernreformation.org/default.php?page=articledisplay&var2=881 I think you will find that the sense of God hidden in our vocation is critical to Lutheran Christians such as Bach. It was more than just about putting food on the table. His writings, service, and all of his life reveal this. Oh why, oh why is there no modern day Alfred to rescue poor church folk from the rampaging oppression of that most Boneless of instruments, the Organ! What people hear in the cacophonous bleating I will never understand. And the hoards of followers who cannot live and let other instruments live–except twice a year when a few horns and drums escape their dungeons to express themselves on Christmas and Easter. The oppressive truth squeaked through the narrative when we read that Bach could not even suffer a poor bassoonist to share the street! That most noble and glorious of instruments, the bassoon! This is indeed turning out to be a sad day for those of us who yearn for the day of musical diversity in worship! Perhaps you have never heard a good organ or organist — they aren’t all created equal, you know . . .
People might think me a traitor for not voting for Bach since I’m a professional musician and have sung and played Bach forever! He’s one of my favorites to sing because of the strictness of his music and how it tests one’s technical abilities. However…being a good King and uniting a country is really more important. Without this type of stability, a musician (or anyone) can’t thrive in any country. And yes, I do believe Bach to be a saint since he was a church music director, but this time I have to vote for the man who united the country, sought to provide his people with more religious education and education in general, and provided for the well-being of his people. Deborah, Ivar the Boneless, I just found, was a Norse “berserker” (fought with a trancelike rage that might have been drug- or drink-induced along with his bros Hubba and Bubba–okay, I’m kidding about Bubba) to kill St. Edmund and capture York. Called Boneless b/c he was snaky, impotent or had a bone disease which rendered his legs useless. Sounds like an interestingly scary person! Easy choice. Anyone who can write such amazing music, while contending with encroaching blindness, will get my vote any day of the week “and twice on Sunday”(that’s a joke, SEC)! Fun Fact: our choir director has a mat in front of her office door that reads “Bach later…..Offenbach sooner”. I always get a chuckle out of it. So mu;ch has already been said about Bach. I want to add just one more comment. as far as I can see. By the way the logo for the American Guild of Organists is Soli Deo Gloria. Scott and Tim, this match up was just plain mean. Just mean. But thank you for including Alfred. Bach’s music is of course marvelous, but Alfred’s wise statesmanship played an irreplaceable role in the development of the English State & English Common Law, thus ultimately the United Kingdom and her several daughter States, the US among them. His impact on the religious development of England and her daughters is just as important as his political and social contributions. It’s Alfred the Great hands down. Let’s see: (at church alone) junior choir, senior choir, and church organist for a good forty years (I always refer to myself as a “country bumpkin organist” since I am not very accomplished). At my last position as organist I always told my tiny volunteer choir (92 % of whom could not read music) that they should not worry so much about the congregation, but should just sing for the love of, and to the glory of, God. Dang! That little “mini tabernacle choir” was good! JSB all the way!! Much as I love the complexity and sublimeness of Bach’s music, for world and historical impact it has to be Alfred all the way. As a choir member, I would vote for Bach, but fighting against “Ivar the Boneless”…well, how can you not vote for Alfred? Ditto. Well, I’m just a music appreciator, and I love Bach’s collect about “the beauty of God,” but I’ll be durned if I’m not going to hear the full story about Ivar the Boneless. Bach gets my gratitude but Alfred gets my vote. Another tough choice, but as others have said, it is the music that does it for me. Bach rachs! We need a like button on the comments!! YEs, Leslie! I keep looking for the Like button! The first time I ever heard the Bach B minor Mass, it filled my eyes with tears and my soul with profound love. The music is so beautiful it must be true, it must be the Gospel. Bach, Bach, Bach! You are definitely in that great cloud of witnesses! I have learned so much from the Comment Section thanks for having this. It gives as much insight to, who vs. who, as the descriptions of what they did. Sometimes I wonder what is going on in the Communion of Saints during Lent Madness. Do they place bets? Cheer with gusto not only with every vote, but with every prayer and poignant comment? Do they try to influence the vote with whispers in our ears or malfunctioning links? Or do they simply rejoice with God that we, too, are part of their number? Alas, though, we’ll never get to see the action figures of King Alfred and Ivar the Boneless during the Kitsch round. Now that would have been Great! Bach to Bach with Bach. I vote for Bach. Kappellmeister = musicmaker? That’s a new one. Alfred is amazing and worthy, but Bach has transported me to heaven more than once. I’m backing Bach. It’s a little suspicious to me that Alfred had three older brothers, was still annointed king, and didn’t have anything to do with those brothers’ subsequent deaths. Although I love Bach’s music, I have to vote for Alfred. Little bit of nostalgia there, my mother was always telling me bits of English history and Al was one of my favorites. Embarrassed as I am to be fascinated by the History Channel´s Vikings show, it gives me a new appreciation for Alfred´s accomplishments. He had to have a larger view of the common good, and not just an ego- and vanity-driven motive, to do all this. On the other hand, I commend to the skeptics about Bach´s motives (no pun intended) the study available in recorded form, Morimur, on the Chaconne from the Suite in D Minor for Violin. This is one of Bach´s ¨secular¨ pieces –written immediately after he returned home from studying with Buxtehude, to discover that his beloved Maria Barbara had died while he was away. It is a rich meditation on grief, faith, and the hope of resurrection in Christ, weaving phrases from the chorales into an increasingly complex tapestry. Consciously, or unconsciously, his music is a testament of vibrant and joyful hope in the God of life. I want to know if the 300 cantatas related to the lexionary are available. I do the readings each morning and would love to have the music. This is my first year for Lent Madness and I am enjoying/learning lots. Thank you! Oops, forgot to ask for an email response, smile. How can I not vote for Bach when we sang one of his hymns at both our wedding and my husband’s memorial service? Yeah for Christian Education Teachers! Both win in that respect, but I vote for Bach and taking the time to do it himself rather than delegate teaching children to someone else.! Not even a contest — I’ll be Bach! I am always moved by the music of J S Bach, Handel, and Purcell, more so of Bach, and I am still finding out more about his many works. I am humbled by the acts of uniting a divided and diversified populace, and setting about teaching them English and ensuring a primary education and religious instruction, as in Alfred the Great, so it was a difficult decision indeed! Is there any question who to vote for? I predict that Bach will win the Lenten Madness. I would vote for him no matter who he was up against. Bach’s music is so beautiful. I can’t think of any of his works that I don’t like. JS Bach was truely a gift from God to all mankind. I was tickled by the unintended humor in both bio’s today. “Bach’s… older brother… introduced him to contemporary music…” Ah, the influence of older brothers –in the late 1600’s, I wonder what that sounded like! and for those who consider contemporary music unworthy, do you think of Bach as an innovator? On the other hand… I also think that Alfred is Great because he had the easiest name (Aethelbald, Aethelred, and Aethelbert?) Albert is the only name that could unite a country! I love reading the comments, a lot to learn; but I’ve had my pie and I do have to work! Actually, if my aging Boomer memory serves correctly, Bach was not so much innovator as perfecter. In his music, Baroque music reached its peak. The year of his death (1750) is considered the close of the Baroque. It’s not that contemporary music is unworthy, but that it hasn’t been sifted and winnowed by time to eliminate that which isn’t of lasting value. Much of what was written by lesser composers of Bach’s day has rightfully ended up in the dustbin. Bach, however, is still revered almost 300 years after his death. And will be as long as people listen with care to music. As a musician (and Lutheran) this is a no brainer! Among the most beautiful music ever written v. fighting the Vikings and uniting England (what does that have to do with Lent or the church) ….. And so Alfred the Great called for the use of the vernacular in the church rather than Latin — so did others, e.g. Martin Luther — and so he taught about religion in the schools — so have many, many others. There is just not enough to overcome the beautiful music of Bach and its universality! Those who think “neither” is worthy should be sentenced to listening to Bach’s music for a week! That is an incredibly unworthy statement! I am a chorister and a lawyer, so I am drawn to both of these saints. Bach contributed great things to music. It’s hard to imagine the world without his beautiful music. Alfred created a system of justice that did not rely on violence and that helped form a basis for our current rule of law. He increased education for all. And he tried to care for both the physical and spirtual needs of his people. He may have become king via succession, but, once he was king, he chose to use his power to make the world a better place. That is certainly not true of all kings. Alfred may not win the popular vote, but he gets my vote today. Sandra Phelps…I think more of usight enjoy having that link…if it’s available. Hard choice. Even though Bach’s music is fabulous, I think he gets recognized in other circles. A politician who supports education and laws tempered with mercy is something I think we should hold up. So Alfred, here’s to you. Love your profile pic, John! I voted for Bach. No church musician could vote against him. I am certain that he must have taught the Catechism as part of his duties a the Thomas Schule. The fact that he was also a teacher is very important. Bach’s music was considered ‘old fashioned’ by the time he died. We see it as the culmination of the Baroque Era, but if it hadn’t been for Mendelssohn’s “rediscovery” of it, it might have well been lost to us. Bleh! Neither of these two were all that and a bag of chips. Didn’t want to vote for either of them. Despite initial inclinations to vote Bach, I vote Alfred. Neither man is greater nor lesser than the other: However, Alfred’s story is the stuff legend is made of with characters Ivan the Boneless, four brother’s Aethelbald, Aethelred, Althelbert and Albert and the Great Heathen Army aka Vikings (Wagner heard now). Al championed the written word and order by law with mercy. Courageous and inspired gets my vote today. I admire Alfred tremendously, and I’m sorry that he wasn’t put up against, say, Antony of Egypt. Under other circs, he’d have my vote. But I have to vote for the man so clearly touched by God, and so faithful in so many things. His music is a gift that will never die. As I learned in shepherding Enmeghabowh in Lent Madness 2012, you’ve got to save great material for the subsequent rounds. Alfred may be Great, but J.S.B. is outasight! This is a hard one! Last fall I visited Eisenach, and the Bach house was probably my favorite museum out of all the museums I visited in a week in Germany…because every single piece of signage was also in English. Not to mention the music played throughout the place, and the awesome demonstration of period instruments! But then I think…Alfred is the one who first insisted on translation into English, which I could say is the root of my ability to so enjoy the museum! ACK! Not to mention, of course, that both played roles in their time that continue to reverberate both through church and society. sigh…choosing is hard! It is a shame that Alfred is likely going to be trounced today. Bach is obviously well-loved by the majority of LentMadness followers – an intellectual and highly educated lot. But some of us just aren’t that much into music….sorry, but that’s the way it is. We tire of the dirges we hear often on Sunday, ( surely not by Bach!) , wishing for more variety of instrument and composer, which just might help us bring in some younger people. However we do love the social justice messages preached in the Episcopal church which has a long history in that movement. Given that history, my vote goes to Alfred whose love of mercy helped lay the groundwork. I sympathise with you, Laura G.! I don’t know why so many church music directors play even the most lilting, dance-like 6/8 meter sacred music like funeral marches. When David danced naked before the ark, I’ll bet the music wasn’t dragging! to be absolutely certain of my vote this morning. When the music stopped, and I came back down to earth…I thanked Bach with my vote. What about Bach’s fight with the bassoonist? Allegedly Bach had called him a nanny-goat of a bassoonist. I am a stand-up bassist and a bass clarinetist, and believe me I understand bass-abuse! I have yet to ambush a conductor at night, but there are times that the end-pins of my instruments pose a great temptation. Still, despite bass-abuse, Bach has my vote for his lasting legacy of faith-inspiring music and his clever counterpoint. As well as being a musician, I am a lawyer (a physician and PhD scientist as well). In that light I have to say that Alfred the Great’s contribution to the law is only one of many — all one has to do is look at the frieze above the Supreme Court, which includes Alfred the Great and many, many others. Bach, on the other hand, is one of a kind! His music has spanned the ages (it has even influenced many contemporary musicians). That is not to discount the contributions of Alfred the Great to our system of justice — even as far as English Kings, one could include Richard the Lionhearted and James I as contributors and there are many, many others — the frieze covers all four walls at the top of the Supreme Court — wall-to-wall. There is just no comparison! I voted for Alfred. I don’t think he will win, but I think he is a vastly underrated Christian. His accomplishments laid the groundwork for much of what is good in Anglican Christianity. If he was a bit fanatical, well it sort of went with the times, and he would not have succeed as he did other wise. Bach’s music is matchless, but Alfred’s kingdom and church begat ours. Both of today’s contestants glorified God, but Alfred gets my vote. He stood for values that I can emulate- justice, education, the good of the whole. Bach brought us beauty (sometimes too-t00 for my ears), but I don’t want to be like him. Skye and Hope voted for Bach the Great (sorry Alfred) and Powerful today. They did so because the Choir Director at St. Andrew’s, Mr. Wilcox, told them to do so. Apparently, Mom needs to take some “how does he get the twins to listen and do what they are told” lessons from Mr. Wilcox. Bach. Because he wrote the St. Matthew Passion. The greatest piece of music, secular or religious, ever written. As part of my Lenten devotions, I take one afternoon and listen to the entire piece from beginning to end. The musical matching of the text is spiritually sublime. Susan Fiore mentioned the aria about Peter’s lament, “Erbarme dich,” which is heartrending. But in the Evangelist’s introduction to that aria– “Und ging heraus und weinete bitterlich” (“And he [Peter] went out and wept bitterly.”) — the muscial writing just on the word “bitterly” pierces the heart even more. Then there’s the final recitative before the final chorus, after Jesus has been placed in the tomb, where in response to each of the soloists, the choir repeatedly sings, like a mother’s lullaby to her dead son, “Mein Jesu, gute Nacht!” (“My Jesus, good night!”). It makes me want to rend my garments. There are hundreds of moments in this piece just like this. This is music written by a profoundly spiritual Christian, inspired by the Holy Spirit. I vote for Bach. I cannot imagine how dry and colorless life would be without Bach’s music—no matter what language it is sung in, nor under which regime it is played. If Alfred had not been great, we would be in need of Bach’s music even more – civilizations and fortunes change but Bach’s music is of constant greatness. Despite any educational or political regime, Bach’s music is continuously inspiring, beautiful, spiritual, deep, even educational. It was man’s inhumanity to man that made Bach suffer—Alfred, too. So both overcame their own difficult circumstances. However, I maintain that Bach’s legacy transcends all circumstances, and benefits all humanity, and for all time. Alfred all the way! Bach was a glorious musician, but King Alfred saved Christian England from becoming a pagan kingdom ruled over by Viking warbands. He encouraged education, built burghs for protection from the raiders, and founded the British Navy. He, his son Edward and daughter Ethelflaed, grandsons Aethelstan, Edmund, & Edwy, forged England into a single nation. Give the man the honor he deserves! William the Conqueror moved Alfred’s coffin from Winchester Cathedral to a small abbey. When Henry VIII started our grand denomination, the abbey was repurposed as a prison. Some convicts broke into Alfred’s coffin and threw his bones away. His golden crown was taken from the Tower of London during Cromwell’s Commonwealth and melted down. The greatest king England ever had, and one of the most devout, deserves more R-E-S-P-E-C-T! That the use of “no-brainer” is offensive is a no-brainer. Cut it out. Fine reasons exist to vote for either “saint.” We are all using our brains and our hearts. I just “had to” say this. Need a little help, please. The introduction to Lenten Madness explains it’s a tournament between 32 saints. I’m not Episcopalian, so I was unaware that Bach is a saint, as well as HB Stowe (yesterday). Really, are they saints? Briefly, what are the requirements? (Or can you point me in the right direction, please?) I’m enjoying reading these biographies, especially the early days saints! Hi Gail. Glad you’re participating in the Madness! In a sense we’re all “saints” by virtue of our baptism. The Church, however, recognizes a number of people who led particularly inspired, Christ-centered lives and hold them up for commemoration. The one requirement for inclusion in the bracket is that they appear on someone’s sanctoral calendar. For instance, Bach is on the Lutheran calendar, Christina the Astonishing on the Roman Catholic, James Holly on the Episcopal Church’s. It’s a bit confusing — I know. The “Big S” saints are Biblical with some notable additions/exceptions. Many others simply led holy lives and the church recognizes we can be inspired by them. Hope that helps a little bit. So if the Presbyterians would just get their act together and write a calendar, we could include Fred Rogers in Lent Madness . . . or maybe the Episcopal Church will include him by adoption and grace — something to suggest at General Convention. As long as we’re looking at a lot of changes, we might as well have one more. Oh yes, thank you so very much! I had no idea. How interesting — and fascinating — to learn about the sanctoral calendar. And that it crosses through so many religions. Thank you for taking the time to explain! Not all the contestants are Saints but also included are worthy people who have made large contributions to mankind. In fact, last year we had an FDR cabinet secretary in the mix. Today I voted to go Bach to my Lutheran roots. People who take things personally, when they are even addressed to them need to read more about what the Lord says about judging others! I meant “aren’t even addressed to them …..” Learn to not take offense where no offense was meant! I have been trying to vote w/ intelligence and reflection. So far it as led to voting each time for the loser. So today, though I feel Alfred more worthy,my heart says to vote for Bach. And my hats off to Molly for the ‘You might be……’ refrence. Giggled myself silly over that. Another day, another agonizing choice! Ultimately I went with Alfred, him being not only the underdog but a man of great import to my English ancestors and the author of a “Book of Doom.” You can’t fail to respect the Book of Doom! These choices are tough on purpose. A significant reason is that it causes us to consider each candidate fully. I am not so concerned with being right as being authentic to my concept of why we select persons as “a christian notables.” (We are all “saints” technically.) My broad criteria are that the person: enriches my own faith, broadens the appeal of Christianity to those in the wider world or swings the hammer of justice. Still not getting your emails daily despite signing up. AAAAARRRGGGG! Is no one on the SEC getting my emails to correct this discouraging and lenten discipline disturbing problem!!?? I can’t see vote totals or comments as a result and must navigate to the home page every day in order to vote. Is it even possible to add my email to the daily sendout??? Please, be saintly and do so…. pretty purple please. Just use the first one: buy a purple alarm clock and set it for 8:00 a.m. Eastern time, and you’ll be all set. I’ve been going to the website every day. It’s really not that hard, and you’ll save yourself from the agony this seems to be causing you. It’s supposed to be fun, right? Unfortunately I missed the last few challenges due to legal work and have tried to catch up. Consistently each session is wonderful. I wished to vote for James Holly but missed it. Today I joined the chorus to vote for Bach because I used to be a concert program boy in my youth and I have an aversion to kings. Susan Fiore: LOL, only a musician could have come up with that one! There’s an alternative version in Episcopal liturgical circles where the difference is between a liturgist and a terrorist. Same answer. Yes, you’re so right! I’m not savvy about these things, or I’d provide the link, but there’s a beautiful version on YouTube by a solo guitarist–Kevin Somebody–that just wrings out my heart. It helps to have those lyrics in my head, too. Madeleine: One of these days I am going to take Bach’s arrangement of O Sacred Head Now Wounded and do it as a baritone solo, but it won’t be easy because it also leaves me with a lump in my throat — and I have been singing in church since I was a little boy! And I only hope I can do it justice when I do! Madeleine: I have a hard time singing O Sacred Head Now Wounded too! Then again if all he ever written was “Jesu, Joy of Man’s Desiring” he would have gotten my vote. God gave us music so we could pray without words. So all music, not necessarily sacred like much of Bach’s, is for me a pathway to God. I vote for Bach! But a king and a musician are an odd pairing. So many of the pairs this week seem to be trying to compare apples and oranges or, in the case of some, apples and coconuts! Alas, these early match-ups are becoming increasingly discouraging for me. The good that I take from this madness is the wonderful extra information provided in the comments that people share. But my voting? I don’t believe one single saint that I voted for has won yet. Before this 40 day electronic exercise I had followed the saints in my daily readings, Lesser Feasts and Fasts now through Holy Women, Holy Men. Therefore, I was glad to see Tim’s reply about where we get the Lent Madness saints from because for days I have been wondering where did they get Christina the Astonishing! I don’t know how many people Alfred is converting today, but Bach is still converting people with his transcendent music. I know — I am one of them. The only down side I can see with this very educational tool during Lent is when people resort to name calling – accusing people of being ignorant just because they have a different view point or don’t view all the facts in the same way. How sad for them. Of course, it’s JSB! I’m the one whose male dachshund was named (AKC approved) Johann Sebastian Bachshund II! I’m not sure my vote counted (are the gremlins still active? ), but no one who made it thru 3 years of college music theory can abandon Sir. Johann who clearly didn’t spend ALL his time on the organ bench. Perhaps one of his wives accompanied him in walking all the way to hear Buxtahude! Let’s hear it for Bach! Today’s saintly selection tends to highlight the genius gene of these extraordinary people! A few years ago, my husband & I sang, with 175 other people, the Bach B Minor Mass. A wonder-full experience! Alfred truly deserved “the Great” title since he established so much—-the shire system for civil order and military defense against the invaders. Alfred transitioned from Danelaw to English home-grown law. Some of his ideas survive today in Britian—-and elsewhere with local modifications. Both saints are wonderful; many books have been written about their accomplishments. I’m voting for Alfred the Great. So enjoying this discussion today & making notes of books to read later, maybe.